Newman Center Alumni who carry on the mission of being a Disciple for the Church and for the world after graduation through active involvement in a Catholic parish or non-profit are eligible for the Fr. Ed Fitzpatrick Discipleship Fund Award. Deadline for submitting your application is April 15, 2019. 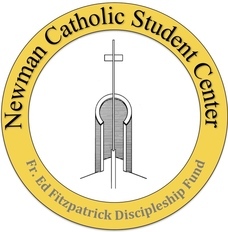 Each year the Newman Catholic Student Center awards scholarships to Catholic undergraduate and graduate students attending the University of Iowa who are involved at the Newman Catholic Student Center. This year we are able to offer 15 academic scholarships of $550 each for next academic year. For more information and to apply just fill out the Academic Scholarship Form online here or on the student table. Apply NOW! A special thanks to the generosity of beneficiaries who support the Newman Catholic Student Center Scholarship Fund at the University of Iowa Center for Advancement.